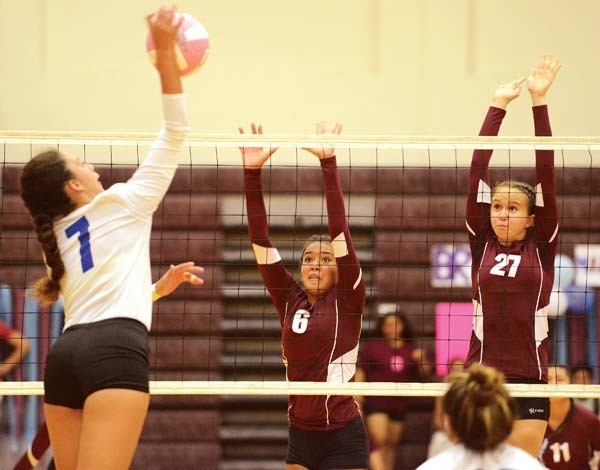 The Maui High School girls volleyball team defeated Baldwin 25-19, 25-16, 25-15 Tuesday night at the Jon Garcia Gym in Wailuku. With the win, the Sabers move to 3-8 in Maui Interscholastic League Division I play, while the Bears fall to 2-9. Statistics were not reported. 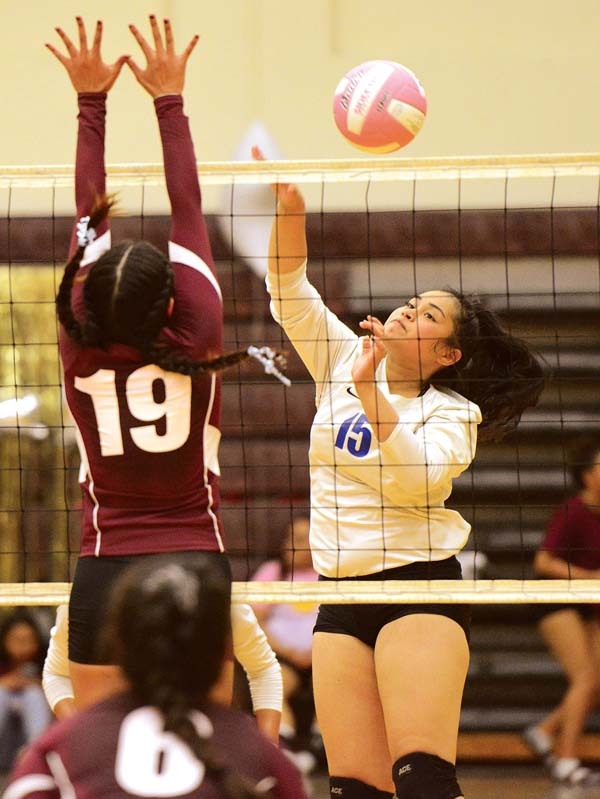 At Pukalani, King Kekaulike was led by Temahh Shaw’s nine kills, one block and three digs as Na Alii defeated Kamehameha Maui 25-12, 25-12, 25-13 to move to 10-0 in D-I play. 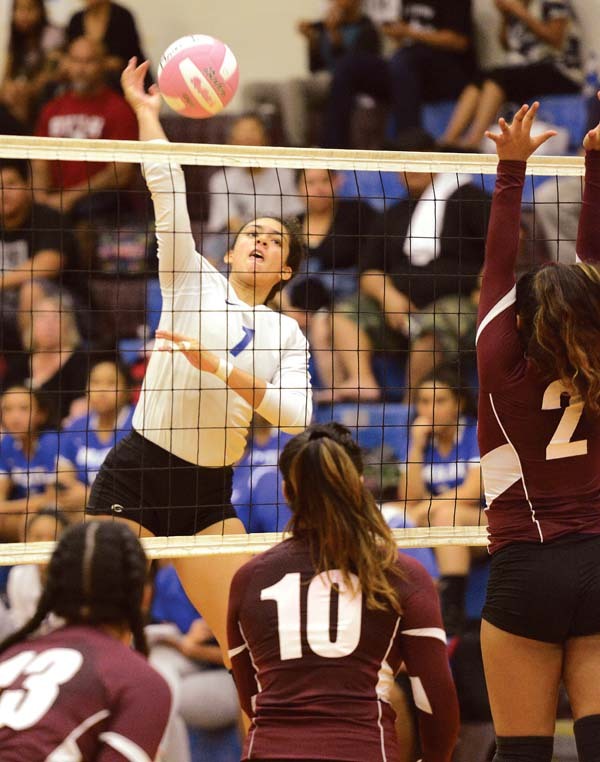 Maui High’s Pua Vakalahi directs a shot against Baldwin’s Bryanna Yoshida. Nanna Inoue tallied three aces and 16 digs and Lauren Albrecht had one kill, nine assists and two digs for Na Alii. For the Warriors (5-4), Hoala Alapai had seven kills, and four digs. Logan Spencer registered six kills and two blocks, Kayla Yamashita tallied 10 assists and Taylor Morita had nine assists and two aces. At Paia, Haleakala Waldorf defeated Maui Prep 25-11, 25-13, 25-20 in Division II play. Baldwin’s Maria King and Sienna DeCambra defend a shot by Rajvong. Mileina Sniffen registered 11 aces, 40 digs and five assists to lead the Hawks (5-2) and Isabelle Palmore had four aces and eight kills. Sekaya Verburg added 18 kills and 13 digs, Sam Spork had two kills, 21 assists and 11 digs and Jade Borchers registered three aces, seven digs and three kills. Maui Prep fell to 0-9.